A FESTIVAL OF MUSIC: Based in Charleston, SC, The Colour of Music Festival recently mounted performances featuring prominently musicians of color at the Duke Ellington School of the Arts, culminating in a performance of the Mozart “Requiem”, in memory of school co-founder Peggy Cooper Cafritz. There are many opportunities to hear performances of classical music throughout the nation, but the Colour of Music Festival is presenting even greater platforms for artists of color. That was certainly evident at the Duke Ellington School of the Arts where the festival presented a culminating concert in DC, featuring Mozart’s “Requiem.” Probably one of Mozart’s most popular and beloved works, it is one that is performed quite frequently in concert halls around the world. What made this concert very special was the performers used for this special presentation. School CEO Tia Powell-Harris and Artistic Director and founder of the Charleston, SC based Colour of Music Festival Lee Pringle were both on hand to give words of welcome. Duke Ellington School of the Arts co-founder Peggy Cooper Cafritz, who died last year was known for her love of musical excellence and fostering that spirit among the students at Ellington. Her dream was certainly memorialized as a full student chorus and orchestra rendered one of the staple works of the choral music canon. Prior to the “Requiem” was the rendering of excerpts from Antonin Dvořák’s Symphony No. 9 in E Minor. Conducted by Maestro Isaac Daniel, Jr., who is on the schools faculty, the young instrumentalists shined in selected movements. Of particular note was the sensitive playing featuring the oboe solo in the famous theme often called “Going Home.” The students responded to Daniel with such attentiveness and he in turn guided them towards a shared rewarding experience. A sense of confidence marked these selections, particular in the first and concluding movements. For the “Requiem” The Duke Ellington School of the Arts Choir joined the orchestra on stage. 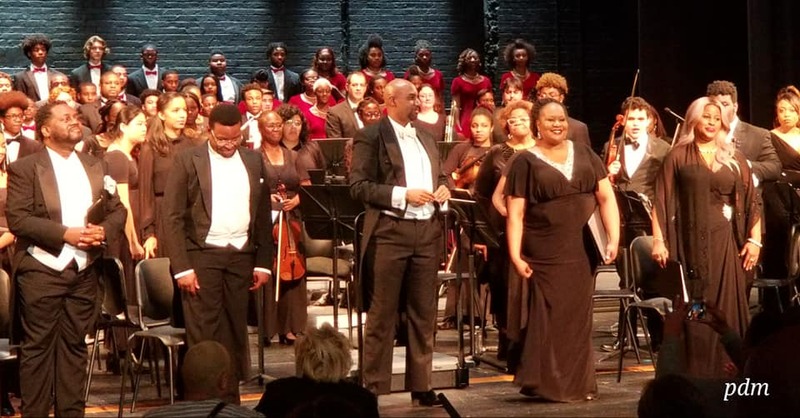 A cast of acclaimed soloists joined the young performers: soprano Marsha Thompson, mezzo-soprano Lucia Bradford, tenor Chauncey Packer and baritone Kenneth Overton. Maestro Joseph Jones led the combined forces in a masterful performance. The choir was exceptionally prepared and that was especially evident in the fugal sections of the “Kyrie” where the voices entered one after the other with confidence. Strong choral singing from the student choral was on display throughout. In the “Rex Tremendae” there was a feeling of majesty that was communicated by the full resonance of the voices. Then there were more delicate moments for instance in the “Hostias et preces” which showcased the more lyrical legato singing by the choir. The outstanding quartet of soloists was a sheer delight. In the “Recordare” the voices were particularly beautifully together. Soprano Marsha Thompson beautifully soared in her vocal lines as mezzo-soprano Lucia Bradford negotiated her vocal passages with a warm lush mezzo. Likewise, tenor confidently Chauncey Packer sang with brilliant, clarion delivery. Baritone Kenneth Overton shined in the opening of the “Tuba mirum.” Almost like an announcement, the singer gave attention to the vocal line as his voice resounded into the hall. Ending the work with a resounding ‘Amen,’ the young performers were accorded with rousing applause. Professional performance opportunities of this nature certainly are in line with the vision of Cafritz and I sure she was smiling down with pride.